Upgrading Paytm Wallet gives a benefit to add up to Rs.1 lakh to your wallet per month where before upgrade the limit is Rs.10000/- per month. Additionally Upgrading Paytm Wallet makes cashback to process with no more delays and also upgraded Paytm Wallet user get access to exclusive offers. So How to Upgrade Paytm Wallet you can know by following below process. 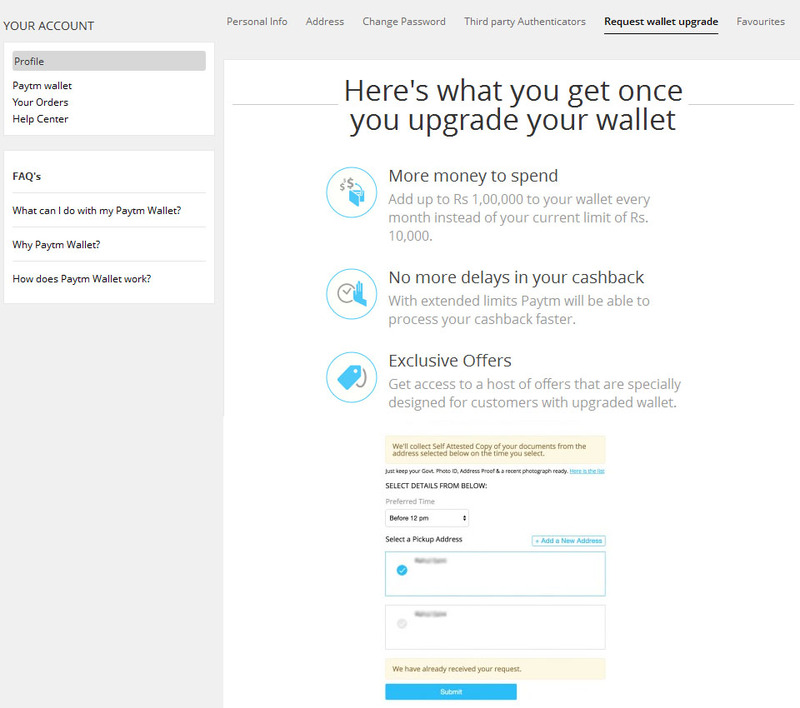 You can upgrade your Paytm wallet only if you have added more than Rs.5000/- in your wallet in the current month. And if you have not added more than Rs.5000/- you will not get option to upgrade your Paytm Wallet. Login into your Paytm account from your desktop or laptop. And navigate to view profile, once you are on profile page click on Request wallet upgrade. Once you have clicked on Request Wallet Upgrade, enter your pickup address or if you have already added select the address and select the preferred time slot which suits you and click on submit button. Paytm executive will visit your address to collect KYC document copies and to verify the originals. So you will have to keep ready self-attested copies of your documents with original and a recent passport size photograph. Once the Paytm executive collects the documents from you, the submitted documents will be reviewed by Paytm. And once the review process completes your Paytm Wallet will get upgraded and you will be intimated through SMS from Paytm. Paytm Wallet Upgrade Process could take up to 30 days. That’s it you are done Upgrading your Paytm Wallet.